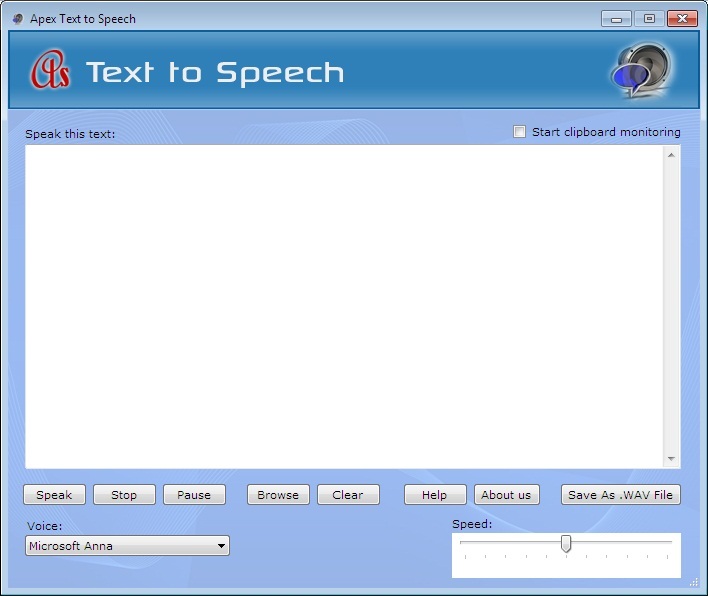 Text to Voice is application provides best GUI working simple easy and fast working tools. Text word reader can also convert any written text into audio files such as WAV for your CD player or iPod and you create your single audio book. The output audio files can be sent via email saved to a folder stored into an audio CD and transferred to other PC etc. File breaker adder tool can works on win XP, 2000, 2003, Vista Win7 and both x32 bits and x64 bit platform. You can make your audio file from your notes eBooks paper notebook and any other readable text document with this best program and there is no need any other supporting application. * You can create your audio notes and listen in by iPods audio player in any where. * Text to Voice provides best GUI. Convert text, web pages, PDF into audible documents in WAVE, OGG or MP3 formats. Qweas is providing links to Text to Voice 2.3.8.2 as a courtesy, and makes no representations regarding Text to Voice or any other applications or any information related thereto. Any questions, complaints or claims regarding this application Text to Voice 2.3.8.2 must be directed to the appropriate software vendor. You may click the publisher link of Text to Voice on the top of this page to get more details about the vendor.